Although the ship itself and a large portion of its contents—such as cask staves, gunstocks, and gun carriages—would have been made of wood, very little wood remains on site, for a variety of reasons. The ship wrecked in shallow water, which would have allowed for salvaging of the products on board. It is also possible that some of the lighter, loose pieces of wood—disassembled cask staves, for example—floated away. The remaining wood, in such a shallow, turbulent area was subject to erosion by the elements and pests, particularly teredo worms, for the past 300 years. After so long under water, the wood recovered from Queen Anne’s Revenge shows obvious damage. Wood that was not protected by concretion shows teredo worm holes, most pieces are broken fragments or worn at the edges, and the internal cellular structure that gives wood its shape and rigidity have been slowly dissolved and replaced by water. 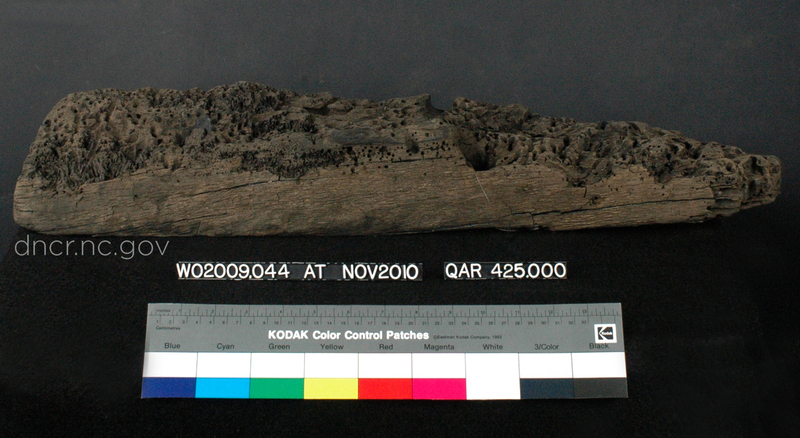 Once they arrive at the QAR Lab, all wood artifacts are kept in water with a biocide to prevent biological growth until conservators can assess and treat them. If the wood were allowed to dry out, the lack of internal structure would cause the wood to shrink, crack, or warp irreversibly. To dry the wood artifacts safely so that they can be displayed and handled, conservators need to replace the water with a different, more dense substance in a process called bulking. The most common methods used by conservators throughout the world today involve the use of a chemical called polyethylene glycol (PEG), which can be dissolved in water and is solid like wax at room temperature. PEG is mixed into the water in increasing concentrations until the PEG has completely displaced the water in the artifact and the wood can air dry. 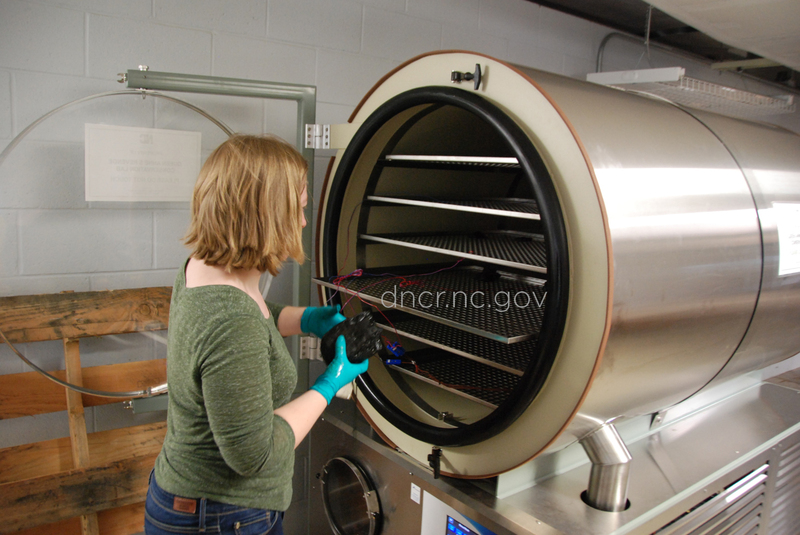 Conservators at the QAR Lab have a second option: replace only some of the water with PEG to provide stability, then complete the drying process in a freeze dryer. Because the water molecules transform from a frozen to a gaseous state, skipping the liquid state, in a process called sublimation, the wood dries with little to no change to its form. Hoffman, P. Conservation of Archaeological Ships and Boats – Personal Experiences. London: Archetype Publications. 2013. The sternpost is the largest wood artifact recovered from the site. Image by NC Department of Natural and Cultural Resources. Freeze dried frame from QAR with teredo damage. Image by NC Department of Natural and Cultural Resources. Loading freeze dryer with wood treated with PEG. 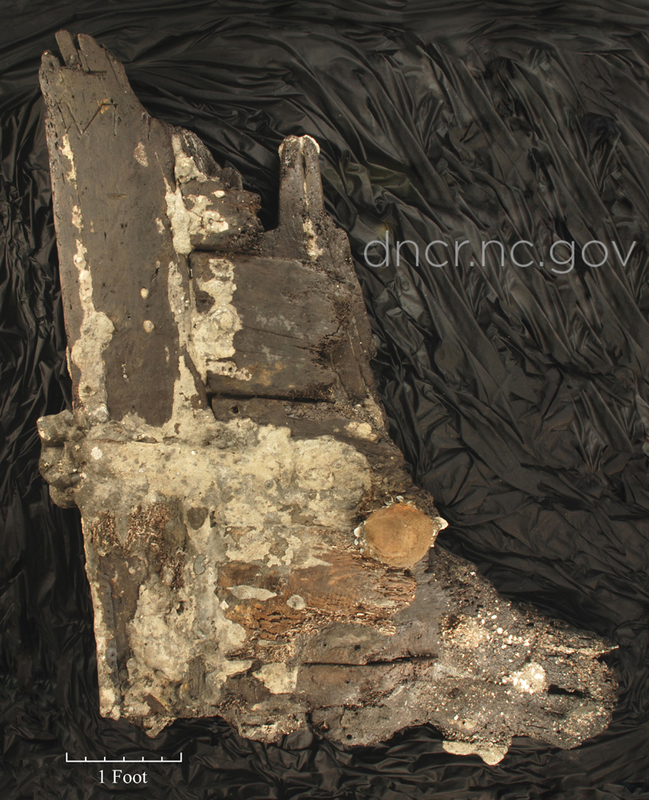 Image by NC Department of Natural and Cultural Resources.